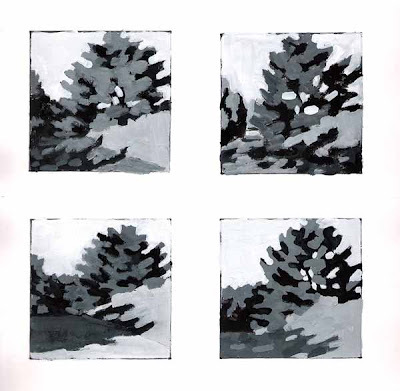 My friend Michael liked the four pine value studies in gouache so much that he suggested a follow-on exercise: do them again in gouache, replacing the values with a set of appropriate colors. So I decided to give that a go, but to choose a color scheme for each one and just see where it took me. Well, guys, I can highly recommend this exercise, because it is REALLY HARD, and so I learned a lot. The seond version (bottom one) has at least three layers of paint everywhere, because I really struggled to use the color scheme I had in mind, and retain the values in the previous study. (The top example here goes with the top left in the b&w version, the bottom example here goes with the top right in the b&w version.) I'm calling the bottom one "Pine at Night". Anyone got a name for the top version? 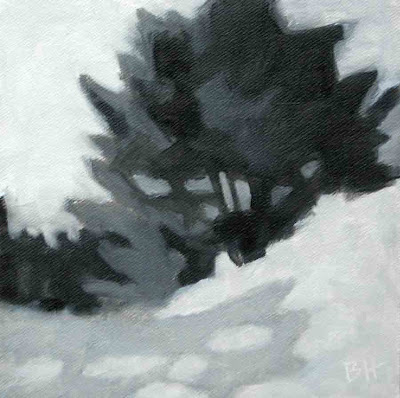 Oil Value Sketch #2 "Porter's Pine Winter"
This is my next effort at the pine value sketch in oil. First I did just two values (dark and light). Then I quickly blocked in four values, and it sat overnight. The next day it was tacky and I made the final adjustments, mostly to the tree sky holes. I like the construction of this one and the fact that the forground looks like snow. It will be fun to do it again in color! 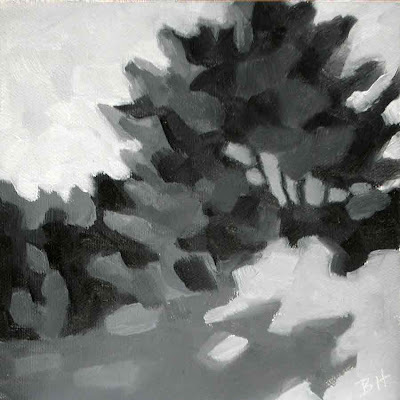 Oil Value Sketch #1 "Porter's Landing Pine"
I really enjoy doing gouache value studies, especially of trees. But I have noticed that the way I handle the paint isn't the same with gouache and oil. I'd like to be able to move the paint around on an oil like I do with gouache. So I thought it would be a good learning experience to try the value sketches in oil. This is maybe my third attempt, after starting on Sunday morning. I tried to use brushes as soft as I use with gouache (softer than my normal oil brushes), and so the major difference is that the gouache dries quickly, so you can paint over and into it while it is tacky. This doesn't happen with the oils (unless you wait until the next day!). I think with this one I am starting to get it. And for those who are missing the color, it's coming back, just give me a couple of more days! 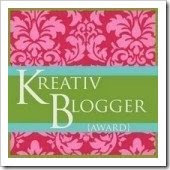 Many thanks to Faye Christian Phillips who tagged me today for a Kreative Blogger Award. I am honored to be chosen by Faye, whose blog contains her beautiful paintings, set off with great quotations. And check out the others chosen by Faye, how wonderful to be a part of this group! 1) My real name is Barbara. 2) I have skied Pikes Peak the day the road opens in Spring (a long time ago...). 3) I have been a (not very good) rock climber. 4) The biggest painting I ever did is 4'X6' (and it was a blast!). 5) I'm scared of snakes but not of spiders. 6) I have painted from a canoe (well, you knew that) and a sailboat (it was moored at the time). 7) I have eaten Fugu (Japanese pufferfish that is poisonous if not prepared correctly). My hosts didn't tell me what it was until after I tasted it - oh, and it is really good. Since I started this blog in February I haven't skipped posting for more than a few days. This time it has been 8 days, and I have so missed it! In the interim I have had some days of worry (and opthamalogist visits) about my right eye. That got in the way of my concentration for sure. But all is well, my eye will be OK. And I will appreciate being able to "paint what I see", all the more. And the retina specialist turned out to be a painter; how about that? Sunday, my friend Suzanne and I went out to scout out some favorite painting places before getting down to work. We stopped to photograph a couple of pines near the road in Porter's Landing (a part of Freeport) and got pretty excited about one of them; great shape, good sky holes, and shadows from the other side of the road reaching over towards it. We took lots of shots, varying the direction and elevation (thanks to a hill). 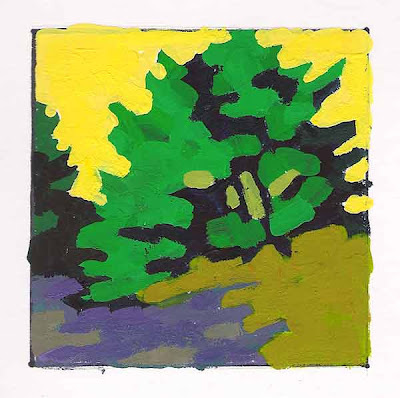 I have to say, after we set up to paint at Cove Road, I was still thinking about that tree. 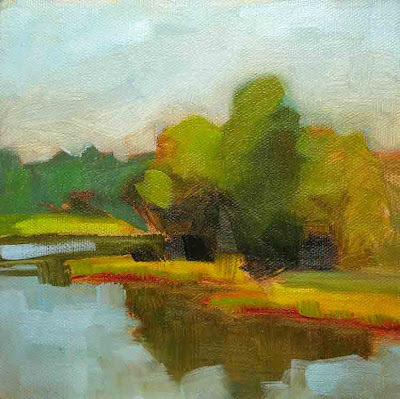 My efforts to paint the marsh in what turned out to be a crowded and noisy environment (it is usually so peaceful there!) resulted in a mess, so I wiped it off. But I kept thinking about that tree. On Monday night I cropped some of the photos and had the idea of painting some very small value sketches to compare composition options. The result is above. I'm not sure that the compositions are very different, but it was a lot of fun. Let me know which one you like best (top left, top right, bottom left, bottom right). I love doing value sketches. There is something about leaving out the color that is very focusing. 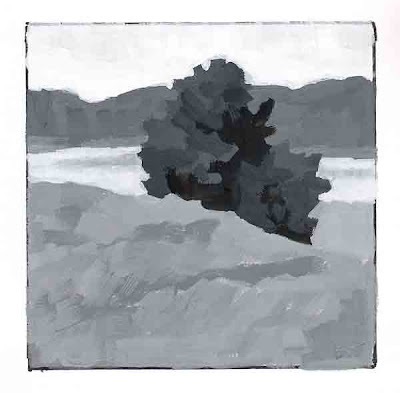 This is the same group of trees seen in the last painting, but from a different location, further to the north and looking down from the top of a hill. I like it! The value sketch is done in gouache. I painted with my friends Joelle and Suzanne today at the very southern tip of Harpswell. It was a gorgeous day, but nothing was working on my easel, two wipeouts! This is yesterday's effort, another Gilsland view, this time from a photo. One of the things I love about Gilsland is the clumps of trees out in the open where you can get a good view from several angles. This is one of favorites. It amazing how different it looks from different directions and in different light. 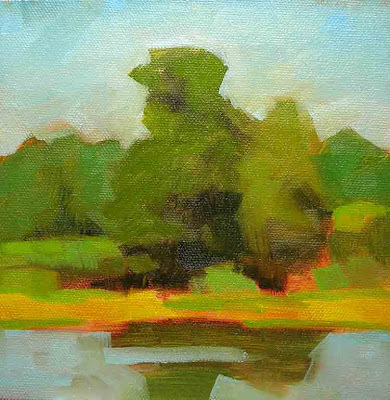 Gilsland #4 is a 6"X6" oil. It is a great day when I get the time to do two paintings! And Tuesday was such a day. This is my second from the same viewing spot as in the painting I posted yesterday. This clump of trees is just to the right of the point and trees in the other painting. I was trying to simplify, get the values, and include some color. I like it! 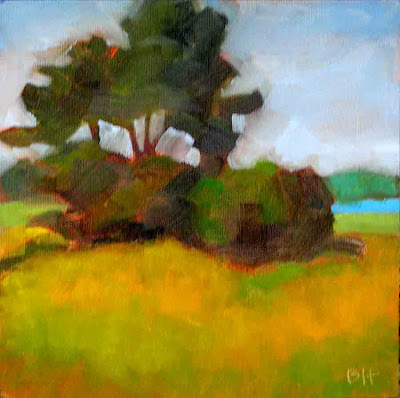 "Gilsland #3 is a 6"X6" oil. I have just notified the August winner of my Painting Giveaway, Mary Sheehan Winn. I am so thrilled, because Mary made the most comments in August (6). Isn't it nice when the random number generator gets it right? Mary has won Mirror Mug. Thank you Mary, for all your wonderful comments! Yesterday I spent most of the day at Gilsland, once again taking pictures and painting. Once that nip of fall is in the air, I start getting worried about reference material for the winter, sort of like a squirrel gathering nuts, I gather photos. Suzanne and I painted at the edge of the North Meadow on the estuary, in one of the bird watching shelters. Looking across the marsh the view constantly changed as the reflections came and went with the breeze, and the marsh grass changed shape with the tide. 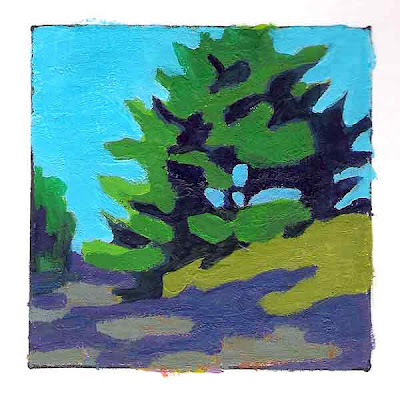 "Gilsland #2" is a 6"X6" oil. It was a wonderfully busy holiday weekend, which we extended through today. On Sunday, we went with some friends to Rockland to see the Connie Hayes show at the Dowling-Walsh Gallery. It was magnificent, and inspirational. All I wanted to do was get home and paint. So yesterday I visited Maine Audubon's Gilsland Farm in Falmouth both in the early morning (for photographs) and in the late afternoon, to paint. This view is from the bottom of the North Field, looking west into a copse of trees with the Presumpscot estuary in the distance. 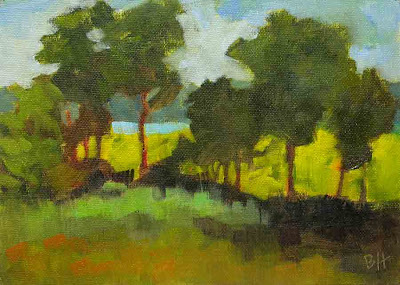 Gilsland #1 is an oil (5"X7"). 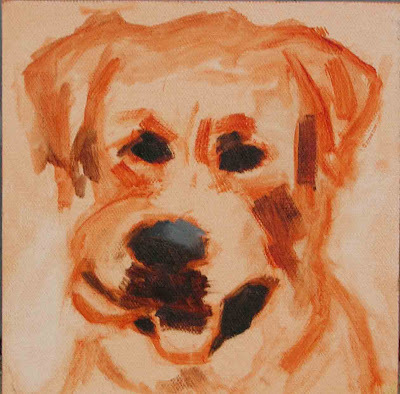 This is the beginning of my painting of my sister's dog, Max, which I did earlier in the week. Max is chewing his purple ball and giving us a big smile. I tried to finish the painting today, but wiped off my efforts (fortunately this was dry enough that I could wipe it off and still have the drawing, which I really like). Sometimes it just goes like that. Wish me luck for the next time. We are off tomorrow to Rockland to visit the Dowling Walsh Gallery and see the Connie Hayes show. That will be inspiring! I hope you all enjoy the holiday weekend. This is a second value study of Backdoor to Seal Bay. The first one was damaged, so I challenged myself to do another. 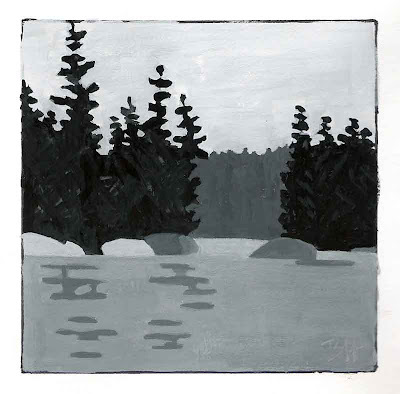 I wasn't trying to make a copy, since I know for me that only leads to a simplified and less lively version of the first effort, but to paint something that was equally pleasing compositionally and still used only four values. However, there was a difference in the gouache I used. Can anyone guess what it was? I will be figuring out who won the August painting giveaway shortly. There are a couple of people who have made comments on the blog but have no email address on their profiles. If you are one of these nice commenters, please send me your email address ASAP!